Our daily life was determined by tube feeds and vomiting. She was tube fed 5 times a day, a big amount of tube feeds were vomited (mainly already during the feeding), due to vomiting more tube feeds were necessary … Very often one tube feed was finished when we already needed to start the next one, resulting in a disturbed digestive function. Although being tube fed, our daughter did hardly gain any weight. We had a lot of dirty laundry and it was hardly possible to go out without being stressed and anxious about Leonie throwing up. Each time she tasted food or just smelled it,she gagged. Her oral intake was zero. Shortly before we decided to participate in the tube weaning program, Leonie suffered from a flu and vomited continuously. It was so much,that she even vomited blood … For me, it was too much to take! Our gastroenterologists wanted to treat her with some anti-reflux medication and discussed to change her PEG- into a PEJ-tube to help decreasing her vomiting. To me it was clear, that putting in another tube would only lead to continuous tube feeds, a new surgical intervention and might not help with vomiting at all. The moment where she suddenly started to crawl and to swallow food (first, we fed her by a finger-feeder and afterwards even by spoon)! Furthermore, she increased her oral intake stepwise, which was fantastic! Yes, especially in the end. All missunderstandings could be solved successfully and all our questions were answered. It is like living a new life: no vomiting anymore, more time to enjoy daily life 🙂 Now, we have communal mealtimes! It is incredible! Fun and laughing during eating – simply to mess around together! It can be difficult to compare feeding therapy to tube weaning programs as they are completely different approaches to the same issue. Understand the different therapeutic approaches. Ask the right questions to a potential provider. 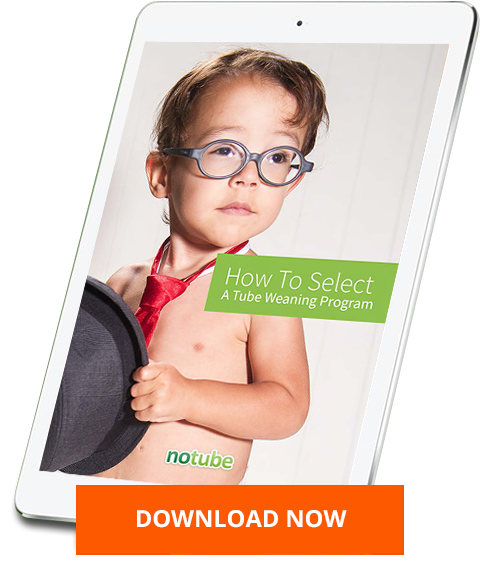 Choose the most suitable program for your tube fed child.